Blazing Hot Wok: Got Oranges? What the hell am I supposed to do with them? Peel and eat them? Drink the juice? Put the segments in a salad? 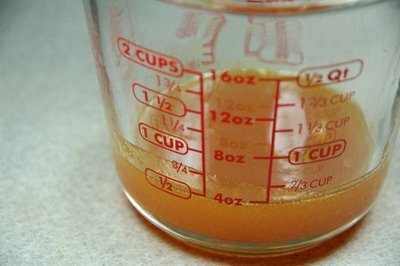 Then I got a brilliant idea: make a syrup by reducing the juice! I’ve done this in the past with pineapple juice and balsamic vinegar. Concentrating the sugars really works wonders on these acidic liquids. They become zingy and potent, perfect for spiking stuff with. There’s no recipe involved here. All you do is squeeze some oranges (in my case, about 8) and reduce the juice in a shallow pan (no cast iron!) until you get a nice, thin syrup. It will thicken a bit further upon cooling. Why not throw in some spices while it’s boiling down, like fresh ginger slices, star anise, cloves, and cinnamon, depending on how you’re planning to use the reduction? If you have leftovers, they can keep about a week in the fridge or freeze it for longer storage. 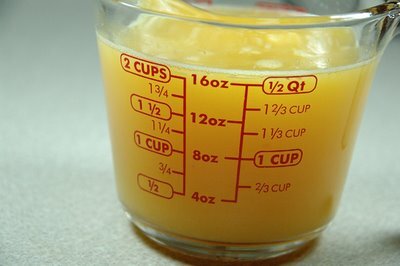 Start with 2 cups orange juice. Get about 1/2 cup citrusy, syrupy goodness. See how it coats the side of the cup? And how would you use this citrusy syrup? I like to use a couple of tablespoons to make a salad dressing. Or a little in a nice cocktail. Or in a pan sauce for something like pan-seared chicken or pork. Or in a sauce to brush over grilled meats. Or in a nice soy-based dipping sauce for spring rolls. You get the idea. 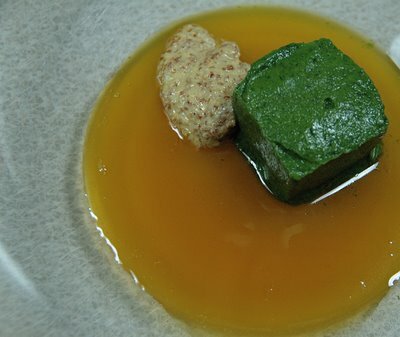 A couple of tablespoons of the orange reduction, a cube of cilantro-garlic puree from my freezer (or about 3 tbs chopped cilantro with 1 clove minced garlic), mustard and a little oil to bring to all together. Very nice salad dressing. Here's my attempt at being fancy-schmancy. 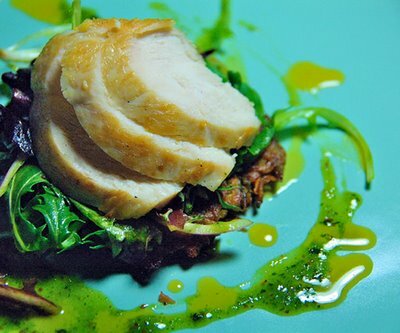 Pan-seared chicken on mixed greens and sweet potato cake dressed in cilantro-orange dressing. This is my submission to Weekend Wokking, an event created by Wandering Chopsticks that spotlights a theme ingredient. This time it's the orange (if you hadn't guessed)! The host is Eating Club Vancouver. If you'd like to participate, there's still time! Send entries by Sunday, Feb 1 to email(at)eatingclubvancouver(dot)com. manggy, too bad you don't like cilantro because this dressing is quite good :-) Oranges are in abundance this time of year and I don't think I can shove another segment down my throat, so this is a perfect alternative. What a lovely dressing! I would love some of those syrup with ice-cream! Oooooh la laaaaa! This is brilliant! 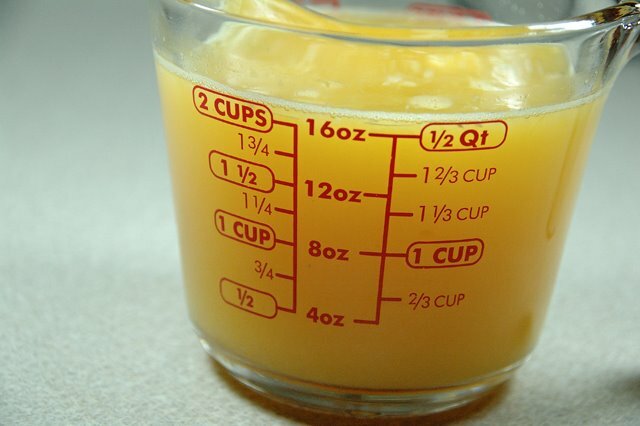 What a great idea to do with orange juice (I'd need to insert a rest-break in there after juicing 8 oranges! ), and I looooove what you did with that chicken. How cool, too, that you can do this with pineapple juice! I'm sitting here so impressed. Geez, I really need to be more creative. Great, great post! pigpigscorner, now you've got me thinking about pineapple syrup with vanilla ice cream and bananas! 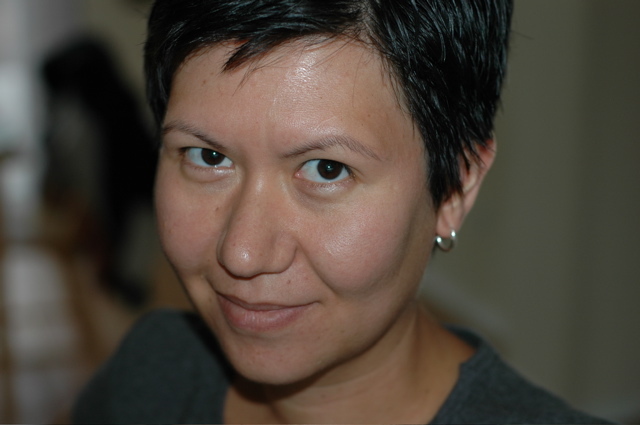 paula, quite simple, huh? Funny how the simple things aren't always the first to pop into our heads. All month I was thinking what the heck I could do with oranges and then I finally remembered about the pineapple reduction, and knew it would work perfect with the oranges. WC, I don't use oranges in food very often, so this ingredient was a challenge for me. I haven't used oranges in marinades, even though it sounds like a natural marinade ingredient. I'll have to try that to mix things up a bit. Gotta say, you pull off the fancy-schmancy with aplomb. The ice cube tray of cilantro-garlic puree is brilliant. I love, love, love the cilantro-garlic-orange dressing! The cilantro and the garlic are perfect foils for the sweetness of the orange. Thanks for the tip about freezing cilantro. esperanza, it's like making pesto. all I did was take about 3 bunches of cilantro (stems and leaves) and about 3 cloves garlic and blend them with a little oil (maybe about 1/2 cup, more or less). It takes a little patience because you have to stop to continually scrape down the sides to make sure you get a nice, uniform paste. Then I portioned it out into an ice cube tray, wrapped that with plastic wrap then froze the whole thing. Makes it very easy to grab a cube to use whenever and where ever! I just wish I could get ahead of the game and have frozen cilantro-garlic puree at the ready. Something else to aspire to. Great idea with the oranges, too. Thanks for sharing (especially the cocktail use part!). What a fabulous idea! This would make an amazing salad dressing base. I also love the thought of a citrus spiced martini. 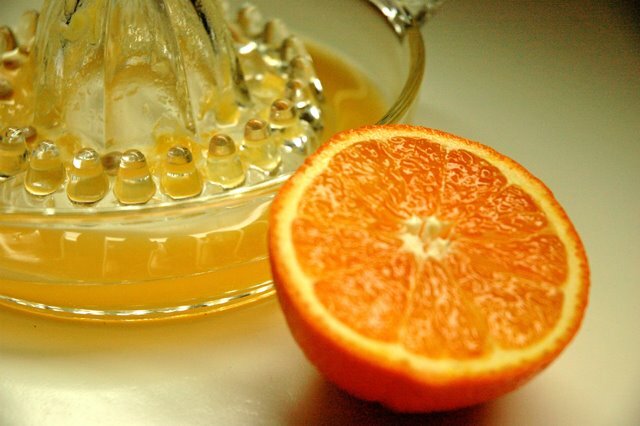 Great, this "orange multi-task syrup" as I will call it is wonderful because is so, so, so versatile and handy and goes perfectly well with salty and sweet dishes, and I guess will freeze perfectly! What a great idea! I always end up with oranges and lemons turning moldy in the fridge. I'm going to cut the mold off at the pass by making syrup.